A rainbow of flavour emerges after a storm of flavour. Nobile Miscela for a perfect espresso. Creamy, velvety, a strong and pure taste and an intense aroma. A flavour of flowers, almonds and roasted bread intensifies its fine quality. A mixture of exquisite coffee varieties from upland plantations. Origin: Central and South America, Asia. 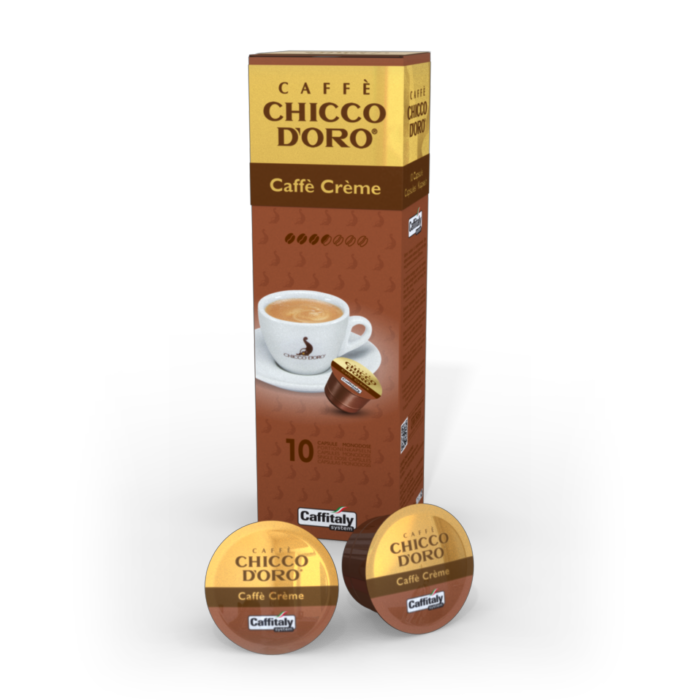 Caffè Crème is a blend created by selecting the best coffee from Central America. 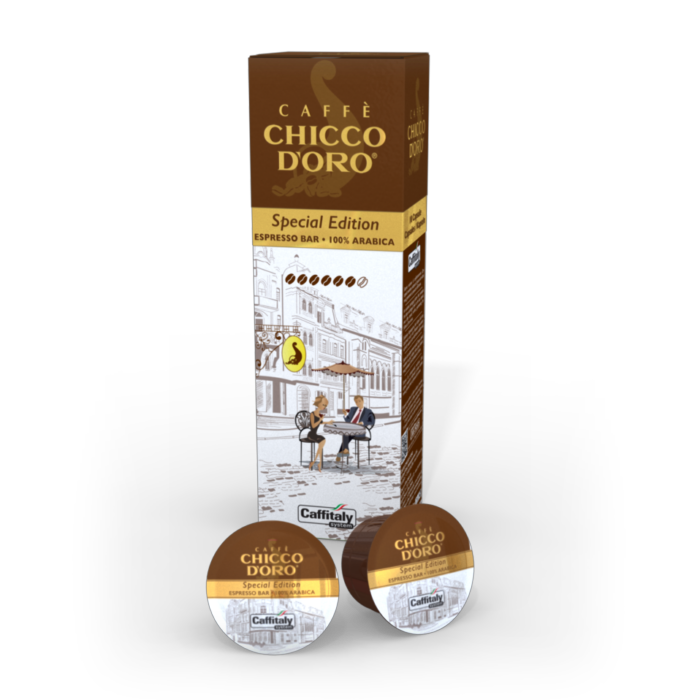 The unique processing and the appropriate grinding gives this coffee a delicate aroma and creamy texture while maintaining the typical taste of an original Caffè Crème made by Chicco d’Oro. This forest coffee releases a strong, full-bodied flavour in the cup. Spiced aromas blend perfectly with notes of sweet toasted bread and a chocolaty aftertaste. Coffee beans that yield an excellent velvety coffee have been grown in the Marcala region for over 200 years. Drinking it, you experience spiced, flowery, citrusy sensations and a delicate acidity. Traits: washed Arabica, catuai-type, grown on mineral-rich clayey ground at 1500 metres above sea level. 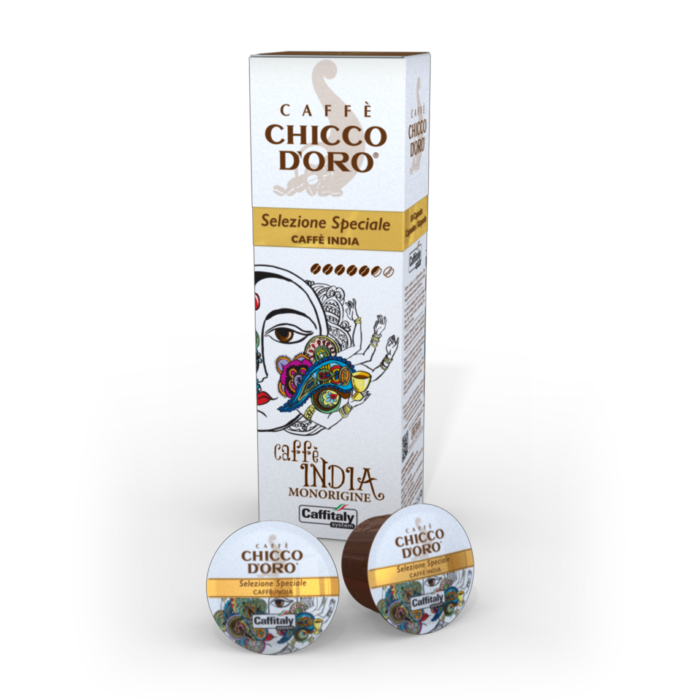 This coffee comes from the Amazonas, Cajamarca and San Martín high grounds of Peru and its taste is rich in aromas, perfectly complemented with the addition of malt, cinnamon and pecan. Characteristics: washed Catimor arabica, grown at 1300-1800 meters above sea level on muddy/clayey terrain. Coffee beans from the Indonesian islands, where the favourable climate and the mountainous terrain regales the former with aromas and a taste that have a unique, recognizable “personality”. Creamy coffee, with a strong flavour, an intense aroma and chocolaty nuances. Traits: robust, grown on volcanic ground. 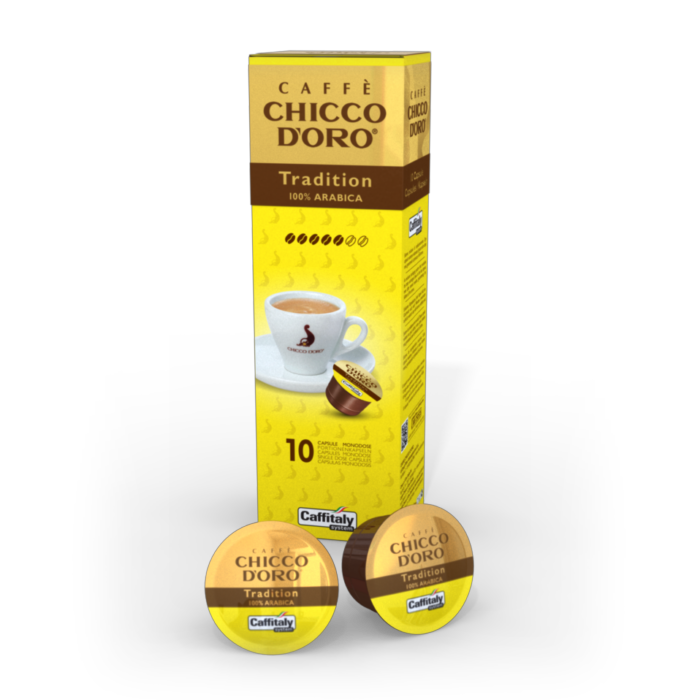 Traditon takes the upper hand in this blend of 100% superior quality Arabica coffee. 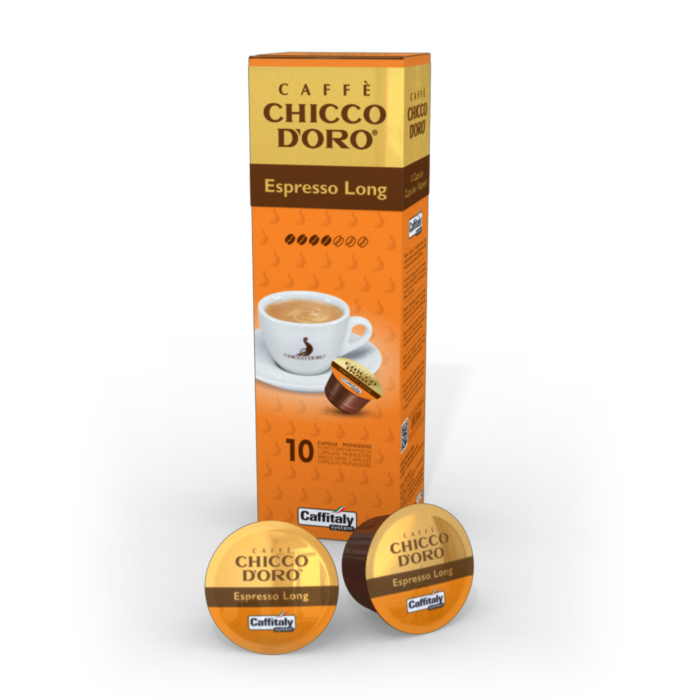 The finely roasted beans enhance the dedicate and pleasant aroma and leave a persistent aftertaste in the mouth. Perfect for connoisseurs. can be enjoyed at any time of day. 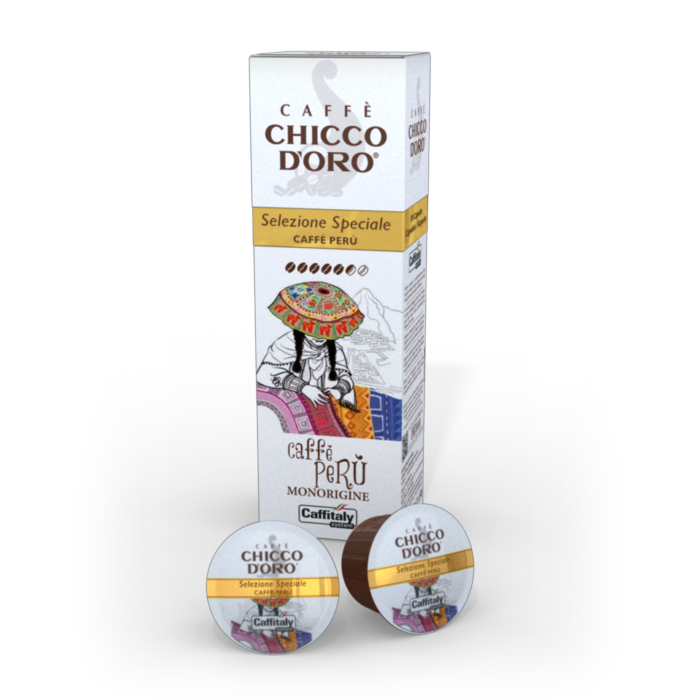 Specially selected bean varieties from upland plantations in Central America are used in this delicate and highly aromatic blend. 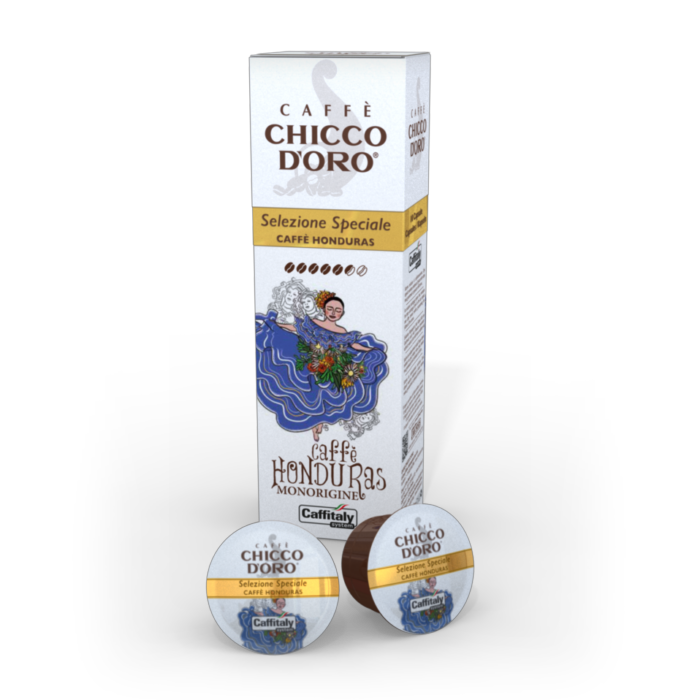 Traditional harvesting and processing methods in the countries of origin harmoniously combine with modern roasting processes. For this product Caffè Chicco d’Oro is committed to purchasing the coffee harvest directly from small farming cooperatives in the southern regions of the world certified by the Max havelaar foundation respecting the main international fair trade standards. Thanks to the natural techniques of caffeine separation, the quality of this coffee remains intact. The accurate roasting phase confers a smooth and exhaustive taste. Caffeine is inferior than 0.1% but without scarifying the taste and the blend of a real traditional espresso.